Proactive Quality Systems: FDA Has Made Them A Priority — Has Your Organization? FDA’s traditional compliance requirements establish a uniform quality system framework, but do not ensure device quality across the ecosystem. Furthermore, a compliance audit will tell a manufacturer whether the system they have established is compliant with current regulations but offers no insight into how they might improve the device, the system, or the development process. As part of its 2016-17 Strategic Priorities, CDRH focused its internal efforts to promote a culture of quality and organizational excellence, and external efforts to “strengthen product and manufacturing quality within the medical device ecosystem.” A recent report from CDRH leadership states that agency “achieved its goals and met or exceeded” all individual targets for the 2016-2017 Strategic Priorities. The agency’s 2018-2020 Strategic Priorities take additional steps to improve device quality through culture shifts and process simplifications, which manufacturers may also find cost-effective. For more information on the CDRH quality pilot, visit http://mdic.org/cfq/enroll/ . Unexpected problems in the field lead to extra regulatory oversight and special inspections. Manufacturers that have effectively invested in quality, thus reducing quality issues in the field, may face fewer corrective and preventive action (CAPA) issues. Additionally, investment can focus on driving organizational improvement, rather than managing the regulator expectations or requirements. This translates into less regulatory overhead and a reduction of activity that does not add value to the product, customer, or business. A focus on product quality and organizational excellence is one of the biggest levers a CEO can use to drive immediate value to the bottom line. Designing for quality and manufacturability up-front leads to a veritable cascade of benefits: higher production yields and rates, lower scrap rates and costs for scrap, reduced overhead from ongoing product issues, and cost savings due to reduced inspections. A patient-focused, proactive culture of quality engages staff to resolve issues faster, identifies new customer needs, optimizes operations, and reduces waste. A survey conducted by FasterCures revealed that, although patients trust their providers and hospitals to use their health data to make decisions that will benefit their lives, they do not trust medical device manufacturers to do the same. One challenge to trust is transparency, especially when many patients only hear about medical devices when a recall is covered in the media. 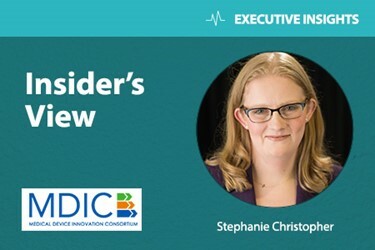 Consistently demonstrating quality — potentially through independent assessment via CDRH’s pilot program and through education about how device data are tracked, shared, and used — may be one way that manufacturers can proactively build a positive reputation among patients. What are the probable ways the design or process could fail, including worst-case scenarios? Stephanie Christopher is the Program Director of the Case for Quality (CfQ) project at MDIC.